Day 3 of the 2015 World Series of Poker saw the Colossus kick off and Michael Wang defeat Bryn Kenney heads up to win gold. Day 3 of the 2015 World Series of Poker at the Rio All-Suite Hotel & Casino in Las Vegas saw an historic tournament kick off as Event #5: The Colossus $565 No-Limit Hold'em held its first two starting flights. Though thousands upon thousands packed the halls of the Rio for the biggest tournament in Series' history, that wasn't the only attraction. Elsewhere, a winner emerged in the first open-bracelet event of the summer, and two unlikely foes engaged in an epic heads-up duel. It's almost a given that a $5,000 event is going to produce a strong final table, and Event #2 was true to form. David "Doc" Sands, Byron Kaverman, Joe Ebanks, Amir Lehavot, Jason Wheeler, Greg Merson, and Bryn Kenney were all among the final 10 runners, but it was Michael Wang making a surprising run to the top to claim $466,120 and the first open-event bracelet of the 2015 WSOP. 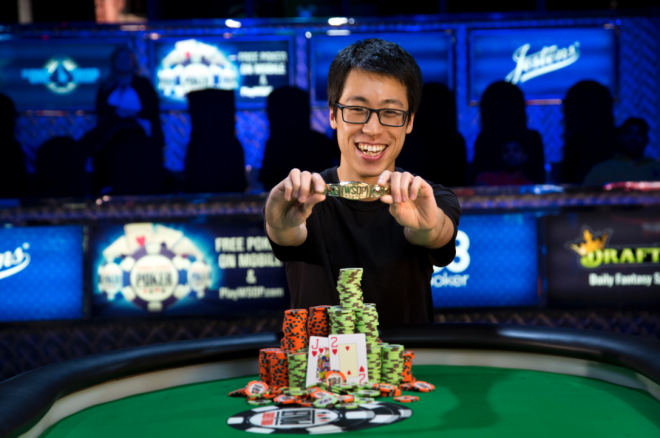 Wang began heads-up play against Kenney at about a 7-1 deficit, but he staged an epic rally to deny the poker superstar his second bracelet. "I can't even process it right now, it doesn't even feel real," Wang said. "Two hours ago I was the short stack and now I just won it. It's surreal." According to the live updates, Wang first won a flip with the against the . That gave him some breathing room with 51 big blinds against a still-monstrous 159 for Kenney. Wang grinded his way to roughly even stacks, but order seemed restored after Kenney retook command and had a lead of more than 2-1. Things can turn quickly in no-limit hold'em, though, and Wang got three streets with the nut straight, then flush-over-flushed Kenney, and it was suddenly over. "I ran good, I'm not going to pretend that I didn't," Wang said. "I won some important races and I like to think I played well, too. But yeah, it was a tough final table, a lot of great players, so it was going to be an uphill climb to win and it's just crazy that it ended like this." The field of 918 has been whittled to 49 after two days of play in Event #3: $1,500 Omaha Hi-Low, and it's an Omahan on top of the counts. Kelly Vandemheen hails from the biggest city in Nebraska and also has by far the biggest stack with 466,000. Next best is Thomas Taylor with 288,000. Others bagging stacks included Eric Crain (236,000), Eric Wasserson (235,000), Robert Mizrachi (184,000), Don Zewin (165,000), and John Monnette (117,000). The field reached the money on Friday and a slew of notable names collected payout tickets, including Steve Gross (53rd), "Miami" John Cernuto (62nd), Taylor Paur (63rd), Allen Cunningham (75th), Aaron Steury (78th), Ari Engel (85th), and Chris Bjorin (99th). The tournament resumes on Saturday at 2 p.m. and is scheduled to play to a winner, but that may be difficult with so many players left. A strange day concluded in Event #4: $3,000 No-Limit Hold'em Shootout, leaving a final table of 10 set to return on Saturday. Things kicked off with 10 tables of four each, and stacks were quite deep, leading to an interesting dynamic. Ultimately, it was Nick Petrangelo (474,000), Andreas Hoivold (472,000), David Peters (467,000), James Woods (462,000), Brian Lemke (460,000), Derek Bowers (460,000), Loni Harwood (446,000), Jeffrey Griffiths (445,000), Leo Wolpert (444,000), and Jason Les (443,000) emerging from their respective tables. Woods did so after an epic heads-up battle with online superstar Doug Polk that last several hours and saw momentum and the lead change hands repeatedly. Carlos Mortensen, Jason Somerville, Jake Balsiger, Jeff Gross, Craig McCorkell, and Sam Greenwood also fell short of advancing. Speaking of epic, one of the most epic events in poker's history kicked off with Event #5: The Colossus $565 No-Limit Hold'em. At this point, the event looks to have been a smashing success, with tournament officials estimating more than 10,000 participated in the first two starting flights, with two flights remaining on Saturday. No official numbers have been released as of this writing. Each starting flight played 11 levels and saw roughly 4,000 eliminations apiece. Of the stacks that have been tallied, evening leader Ian O'Hara (184,000) holds the heaviest count, followed by Ty Durekas (179,100), who topped the morning flight. The overall picture should become clearer as Saturday wraps up. *Photo courtesy of the WSOP.